Changes RCV, TND, EMPTY, BLOCK and BOMB orbs into Matching orbs. Kuma will send away 1 of your characters to vacation. (Remove from play) Bottom>Middle>Top each 4 turns starting with Pre-emptive. 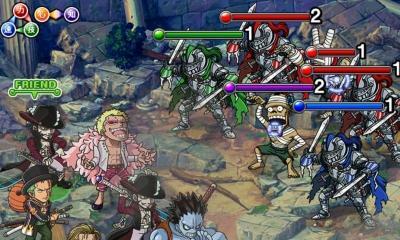 Next turn, Shogun zombie will "Berserk" all enemies, buffing their ATK and let them attack all at once, every turn. Start with comboing up the Turn 1 mummyies and deal finishing blow on the turn 1 Knight. Repeat with the other Knight afterwards and stall on the turtle, then lobster. Knights effects apply when they are damaged or it's their turn. Cuts your combo at 2.0 MAX. Trick here is to blast off all the mummies and dragons, and keep a pet to stall on without a limit using a 10 ATK penguin and MISS. If you use a Thatch in your team. Activate special right before finishing this stage. Pre-emptive: Removes random bottom row character from play. Debuff protection for 99 turns. Disables damage from STR and DEX characters. Heals 90.000 HP for 3 turns. DEF Buff for 99 turns. 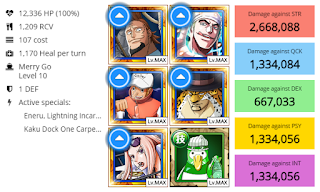 This matchup can work well if Kuma will remove the Penguin. 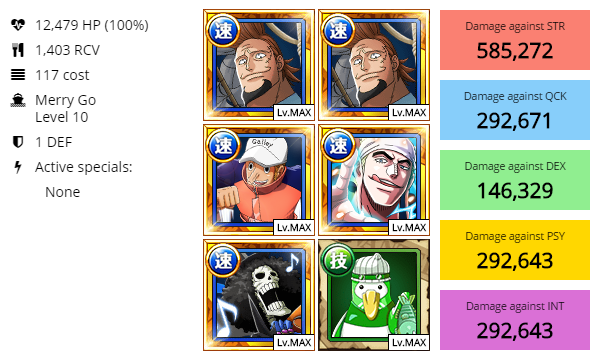 You may need a heavier orb boost like Doflamingo if Hina disappears and won't fix the orbs. Quite the same. You will definitly be able to use the specials. Bottom row is useless. It's advised to have a better orb booster though. 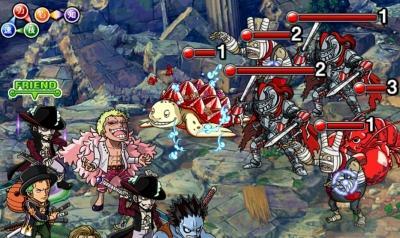 This one is quite difficult to survive on Stage 2-3 because of the DEX Knights. But you can do it. High RCV and [Meat] might save you. Use Thatch and Lucci special at the end of stage 4. 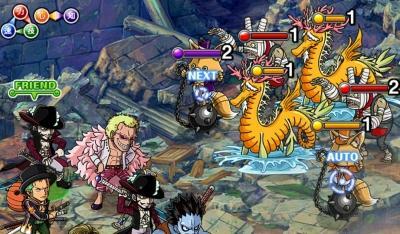 Last hit with Enel always. 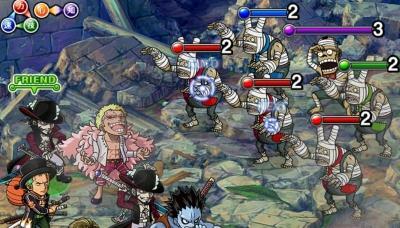 Start combo with Doffy, Ray up to Enel. Try to get up all QCK orbs on stage 4 so you can use Lucci in boss fight and combine it with Jabra. Ganfall can boost Sengoku if Crocodile is removed which isn't bad at all. You could also do a team of Boa and Enel that's the team I used to beat the stage. 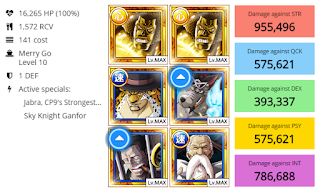 The lower the special for Enel the better and the most RCV he has the better also. I passed 60 stamina with this team even though I did take a few tries but I was able to pass it at least twice without using gems. 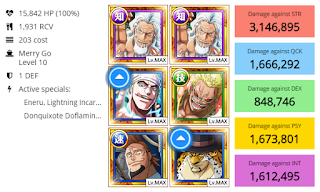 My team made up of Maxed Boa-Captain, Maxed Enel with Maxed special-friend, level 67 Capone with 18 special, level 63 Thatch with 16 cooldown, level 80 Enel with 29 cooldown, and level 62 Killer with 34 cooldown. 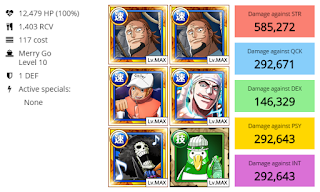 My Enel and Killer were on the bottom row because their specials did not matter all I had to stall for was at maxed 17 turns for Enel. 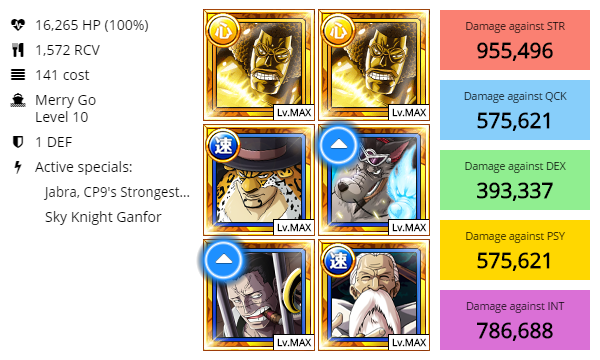 I would do the first 4 turns with Kuma regular attacking, and after he attacked I would then use Enel's special and heal with Boa to do a huge deadly attack to finish him off. Enel and Killer were my 2 strongest Qck characters that was the reason I used them, Capone canbe replaced also with Doma or another orb manipulator, same goes with Thatch. The game says "assorted" not "matching" even after evolution.Is that a typo?